As discussion intensifies in California concerning Pacific Gas and Electric Company's (PG&E) plan for advanced metering, demand response and predeployment expenses, advances in communications based on high definition FM radio technology may challenge common assumptions of how to best implement automated controls for price responsive demand response programs. Rather than use the advanced metering network to communicate with customers or customer thermostats, one interesting concept is to use FM radio to send pricing information to customer locations. e-Radio USA (www.e-radiousa.com) is developing a product, Utility Message Channel (UMC) for the utility industry that will allow utilities or other demand response providers to have e-Radio USA send price signals to thermostats, appliance controllers, or in-home display devices. One advantage is that it gives utilities another flexible technology choice that can operate cost-effectively in parallel with AMI systems—so utilities can proceed with their plans for advanced metering using AMI systems that have been successfully deployed by other utilities without putting all of their eggs in a single technology basket. High definition (HD) FM radio is the emerging next generation digital technology for the radio broadcasting industry in the United States. This technology will offer enhanced audio features and data delivery capabilities. The current number of transmitting HD Radio stations is approximately 500, and this is expected to grow to 2,500 over the next few years. HD Radio stations are mostly located in larger population centers and this will likely be true for some time to come. The largest radio broadcasting companies have committed significant capital to convert their analog stations to digital HD transmission. e-Radio USA products will work with either analog or HD digital signals, allowing for a smooth transition from analog to digital. By considering the use of two networks rather than one, it changes the picture for demand response considerably. It is no longer necessary to insist on two-way communication all the way to the meter to allow for future requirements to send pricing information to customer thermostats. Meters can focus on measuring energy and communicating with AMI systems rather than taking on the role of a gateway into the home. To use the FM network to communicate to customers requires no new network infrastructure since FM radio stations already exist and service other industries, and importantly, continue to operate during outages (this assumes a battery-powered information display device, of course). Within the customer home, the equipment required (programmable communication thermostats, in-home display devices, other controllers) could receive pricing information directly rather than relying on many connections of an AMI network. e-Radio USA is participating in the Title-24 activities in California to establish guidelines for communication with customer owned thermostats, and plans to design its UMC receiver to be compatible with those requirements. Utilities in other states may find the e-Radio USA offering of interest, especially if the utility has already installed an automated meter reading (AMR) system. Using FM radio technology, the demand response program can overlay an existing AMR system, even mobile RF systems. FM radio has tremendous coverage, providing coverage to almost every home in the United States. Critical peak pricing information can also be targeted to relatively small areas allowing demand response events to be called for localized problems as well as across the entire service territory or region. Cost is always a consideration, and the e-Radio USA receiver and usage charges are expected to be competitive with paging communications. 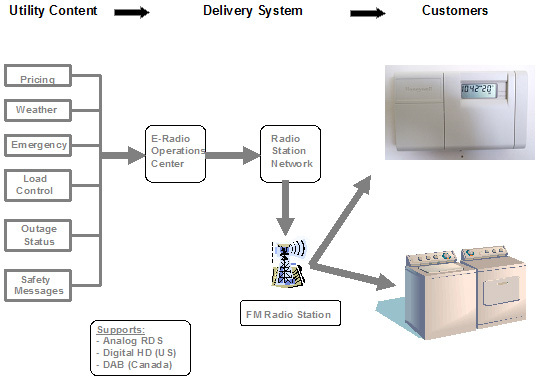 e-Radio USA currently has software installed in radio stations that has been designed to manage communications, requiring utilities to only select the group of customers, and e-Radio USA takes it from there. e-Radio USA is planning to work with demand response providers and other vendors to incorporate their receiver technology into their products, and recently participated in the Energy Venture Fair in Boston. HD radio receivers are expected to scale in the home and automobile industry in 2006. While analog FM radios in cars have a display that usually show the name of the artist and song while the occupants listen to the music, the emerging digital technology of radio broadcasting will allow more and different types of data to be displayed in cars. The data is embedded within the FM signal, which means that anywhere a customer can listen to an FM station, a utility or other provider can send a pricing signal to the customer location. e-Radio USA is also developing a traffic information service that provides useful information to the driver based on the current location of the vehicle. If there is traffic alert, the radio indicates the availability of the alert, and the driver can choose to read the alert. The driver is only shown information relevant to his or her current location, and does not have to listen to traffic updates for another freeway or a location across town. Utilities are in the best position to select the most effective method for measuring energy usage to support critical peak pricing or other time-based rate options. In fact, it is likely that the most stringent demands for obtaining AMI data such as outage alarms stem from utility operational needs rather than to support demand response programs. Energy measurement occurs at the customer meter, often located outside or in the basement, away from most customer activity. Customer information needs to be provided to the customer, or perhaps to customer owned equipment, to allow for automated response to the pricing information supplied by the utility. Thus, meter reads need to be transmitted from the customer meter to the utility and pricing information needs to be communicated from the utility to the customer or customer equipment. There may be distinct advantages from utilizing separate networks to accomplish each of these functions. Consider outages. Utilities have found customers value information on the expected duration of an outage. Since e-Radio USA will be able to target the information to small geographical areas (within 100 feet) using the HD technology, utilities could use the FM radio to provide expected repair times down to the distribution transformer level and eventually, to the individual home. Since most thermostats operate on a battery, the thermostat should continue to display during an outage. This is another example of how using two networks can provide superior service than using one network. Using one network, in order to provide this information to the customer within their home, every node on the AMI network would have to remain powered by battery backup during an outage. Using two networks, this is not required. Battery backup on the AMI network can be determined on the basis of outage detection, restoration, and meter reading requirements rather than on customer communication requirements. Municipal utilities may find the e-Radio USA UMC product appealing for its ability to also transmit messages during emergencies, such as Amber alerts or evacuations due to a fire or flood. Chart 1 e-Radio USA UMC Architecture below shows the overall architecture of the proposed e-Radio USA UMC product. e-Radio USA is in the process of developing low cost chip sets to allow utilities to send customer specific usage information as well. This would allow utilities to use UMC to send customers updates on their usage at regularly scheduled intervals. As a graduate student in economics at UC Berkeley, I developed a rule of thumb that if a problem seemed "too hard," I would start over. Usually I found that I had made an assumption that sent me down a wrong path, and only by starting over could I see the error and find the solution. The "error" in this case may be the assumption that using one network to do it all is better. Many of the new, costly requirements being considered today for AMI networks stem from an assumption that these networks must be the be-all and end-all of utility communications to the home. They are being asked to perform communications with customers, provide a robust network for meter reading, enable appliance control, and many other functions. Yet utilities (and other businesses) have always used multiple communications networks—mail, phone, voice radio, data radio, the Internet, mass media—and will continue to do so, since different networks have different advantages for different purposes. Within metering, virtually every utility has some manual meter reading and some telephone-based commercial/industrial AMR, even for those utilities that have rolled out large-scale wireless or power line carrier AMR deployments. PG&E, in working to achieve the most cost-effective business case, is planning one technology for electric meters, one for gas meters, and the retention of telephone and other technologies for at least some of its largest customers. In explicitly planning for using more than one network, utilities and regulators are likely to find a more cost effective, flexible, and reliable solution, and be more confident that proceeding ahead with large-scale AMI deployments will not lead to technology dead-ends, but successful, multi-lane highways. IssueAlert Archive Click here to receive UtiliPoint's daily IssueAlert via e-mail. UtiliPoint's IssueAlerts are compiled based on the independent analysis of UtiliPoint consultants. The opinions expressed in UtiliPoint's IssueAlerts are not intended to predict financial performance of companies discussed, or to be the basis for investment decisions of any kind. UtiliPoint's sole purpose in publishing its IssueAlerts is to offer an independent perspective regarding the key events occurring in the energy industry, based on its long-standing reputation as an expert on energy issues. Copyright 2005. UtiliPoint International, Inc. All rights reserved. � - 2005 UtiliPoint International, Inc.